There are so many kinds of love... and so many ways to share it! 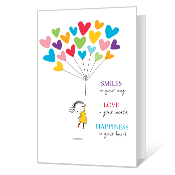 Send Valentine's Day eCards to someone special this year, speedier than Cupid's arrow! Our eCards for Valentine's Day have the sweetest sentiments, the biggest smiles, and the coolest animations to suit every sweetie on your list - from friends to kids to spouses! Hope Your Valentine's Day is Nice, Nice Baby! Fall in love...all over again with these romantic valentines. You can make a personalized box of candy hearts by adding your name and selecting the 6 hearts you'd like to send. Happy Valentine's Day from NAME. If you're looking for Valentine's Day eCards, funny cards are the way to share the lighter side of love. Hope your Valentine's Day is filled with fun surprises! Happy Valentine's Day! Talking valentines help you say it with your heart! Show that special someone just how much you care! 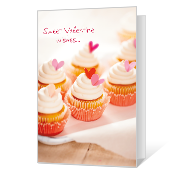 Cover Verse: Sweet Valentine wishes... Inside Verse: ...for a very Happy Hearts Day! Check out these Birthday eCards from Blue Mountain! Valentine’s Day isn’t just for lovers. Let someone special know you care this Valentine’s Day with an eCard. From funny cards to romantic sentiments, there are a number of reasons – and people – to send a Valentines eCard just the click of a mouse. 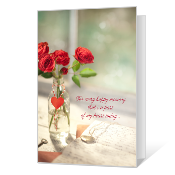 Whether you’ve been married for weeks or years, or are in the early days of your romance, let them know how you feel with a romantic Valentine’s eCard. Who says you have to have a sweetheart to celebrate Valentine’s Day? Send funny eCards to friends to make their (V)day. Liven up the office for Valentine’s day with fun, office appropriate eCards – from singing cards to quirky messages to add some laughs to the work day on February 14th. From letting Mom and Dad know how much you love them, to cute Valentine’s eCards for kids, send a sweet message to family members wherever they are. 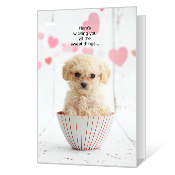 Blue Mountain makes it easy to send Valentine’s eCards with the touch of a button, letting the people who matter most know that they’re never far from your heart – on Valentine’s Day or any day of the year!